The Junkers G.38 was a large German four-engined transport aircraft which first flew in 1929. Two prototypes were constructed in Germany. Both aircraft flew as a commercial transport within Europe in the years leading up to World War II. During the 1930s, the design was licensed to Mitsubishi which constructed and flew a total of six aircraft, in a military bomber/transport configuration, designated Ki-20. The G.38 carried a crew of seven. On board mechanics were able to service the engines in flight due to the G.38's blended wing design which provided access to all four power plants. Structurally the G38 conformed to standard Junkers' practice, with a multi-tubular spar cantilever wing covered, like the rest of the aircraft in stressed, corrugated duraluminium. The biplane tail, found in other large aircraft of the time was intended to reduce rudder forces; initially there were three rudders with only a central fixed fin. The undercarriage was fixed, with double tandem main wheels that were initially enclosed in very large spats. The wing had the usual Junkers "double wing" form, the name referring to the full span movable flaps which served also as ailerons in the outer part. The first Junkers prototype - 3301 and marked as D-2000 - first flew on 6 November 1929 with four diesel engines: two L55 12 cylinder V-motors and two 294kW L8 6 cylinder inline motors with combined power rating of 1470kW (1971hp). The Reich Air Ministry purchased the D-2000 for demonstration flights, and took delivery on 27 March 1930. In flight tests, the G.38 set four world records including speed, distance and duration for airplanes lifting a 5000kg payload. On 2 May 1930 Lufthansa put the D-2000 into commercial service for both scheduled and chartered flights. On 2 February 1931 the Leipzig-based Junkers' yard re-engined the D-2000 with two L8 and two L88 motors giving a total power rating of 1764kW (2366hp) and increasing passenger capacity from 13 to 19. The G.38, during its early life, was the largest land plane in the world. Passenger accommodations were sumptuous by today's standards and were meant to rival those found on the competing Zeppelin service offered by DELAG. The plane was unique in that passengers were seated in the wings, which were 1.7 m (5ft 7 in) thick at the root. There were also two seats in the extreme nose. 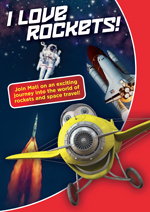 The leading edge of each wing was fitted with sloping windscreens giving these passengers the forward-facing view usually available only to pilots. There were three 11 seater cabins, plus smoking cabins and wash rooms. In design terms the G-38 foreshadowed the Blended Wing Body design currently being developed by both NASA and Boeing as an alternative to traditional tube and wing aircraft configurations. On 1 July 1931 Lufthansa initiated regularly scheduled service between Berlin and London on flights carrying up to 13 passengers. This London-Berlin service was halted in October 1931 to retrofit the aircraft and expand the passenger cabin of the D-2000. Construction lasted from this time until the summer of 1932, during which a second deck was built within the D-2000's fuselage - enabling an increased cargo capacity and seating for up to 30 passengers. Additionally the D-2000's engine were again upgraded to four L88s, giving a combined power total of 2352kW (3154hp). Also at this time the D-2000's certificate number was changed to D-AZUR. Meanwhile, a second G.38 - factory number 3302 and c/n D-2500, later changed to D-APIS - was built with a double deck fuselage and capacity for 34 passengers. Six passengers were carried in two compartments in the leading edge of each wing and the remaining 22, on two levels, in the fuselage. Lufthansa used D-APIS on a scheduled service covering the cities Berlin, Hanover, Amsterdam and London. This aircraft was named the General Feldmarschall von Hindenburg. In 1934 D-2000/D-AZUR had its engines upgraded, this time with Jumo 4 engines, giving a total power rating of 3000kW (4023hp). Both planes were in service simultaneously until 1936, when D-AZUR crashed in Dessau during a post-maintenance test flight. Lufthansa had to write off this aircraft due to the extensive damage, but test pilot Wilhelm Zimmermann survived the crash, and there were no other casualties. The second G.38 - marked D-2500 and later D-APIS - flew successfully within the Lufthansa fleet for nearly a decade. With the outbreak of World War II the D-2500/D-APIS was pressed into military service as a transport craft by the Luftwaffe. It was destroyed on the ground during an RAF air raid on Athens on 17 May 1941. 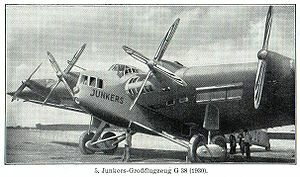 "Junkers G 38". EADS. 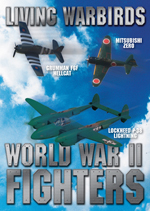 2007-10-11. http://www.eads.net/1024/en/eads/history/airhist/1920_1929/junkers_g38_1929.html. Retrieved 2007-11-26.
translated by Dr. Oliver Schnaedelbach. "Junkers G-38". The 20-2-40 Style Syndicate. http://www.return2style.de/swingaring/amig38.htm. Retrieved 2007-11-26. 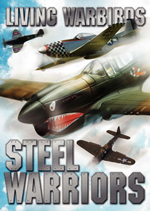 Living Warbirds: The best warbirds DVD series. 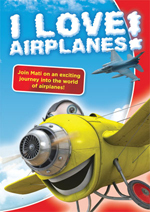 This site is the best for: everything about airplanes, warbirds aircraft, war bird, plane film, airplane film, war birds, airplanes videos, aeroplane videos, and aviation history. A list of all aircraft video. Copyright � A Wrench in the Works Entertainment Inc.. All rights reserved.